I'm churning out the Christmas cards this week! 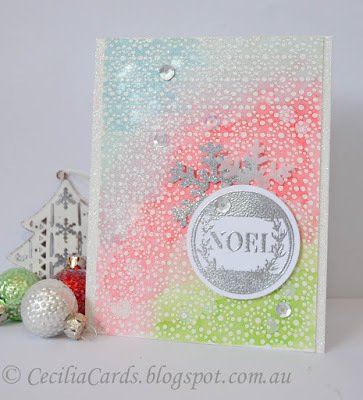 This is made with a Hero Arts background stamp, heat embossed with white on watercolour paper. The distress inks were added to the background and sprayed with Perfect Pearls. There's a nice shimmer on the cards. I made two while I was at it, the second one is lighter in colours as I just used up the left over inks. The sentiment stamp is also from Hero Arts and the snowflake dies are from several different companies. Thanks for dropping by! Cecilia, this is so pretty. 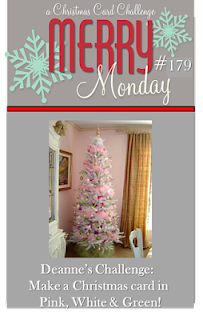 Check out Merry Monday it would work for their challenge too I think. Gorgeous background, Cecilia, and love the way the silver shines against it! Thanks so much for playing with us at Merry Monday! I love the soft background you created! Pretty Christmas card, love the soft colours. Thanks for playing at Merry Monday.